One of the tropical north’s largest tour operators is now better known for its new Yutong fleet following the replacement of 17 of its large vehicles with the brand. Part of Tropic Wings’ philosophy is to promote Cairns’ attractions and increase visitations. Family operated Tropic Wings has been servicing the tropical north of Queensland for more than 40 years with charters, shuttles and school runs. It’s been going from strength to strength following a string of acquisitions in recent years, including buy-outs of local companies. Alongside Tropic Wings Coach Tours, the Woodward family operates Rainforestation Nature Park, Jungle Tours & Trekking, The Wildlife Habitat, Cairns Zoom and Wildlife Dome, Australian Butterfly Sanctuary, ABC Sales & Maintenance and Careers Training Centre. With diversification in mind, Tropic Wings has been expanding into the coach sales, service and parts business. Part of Tropic Wings’ philosophy is to promote Cairns’ attractions and increase visitations. But there was a time when it was more of a "lost leader", therefore shifting gear into a new fleet and a changed business model, explains project systems director and family member Michael Woodward. His parents Charles and Pip Woodward opened Rainforestation Nature Park in 1976, pioneered tourism with Army Duck Tours, and then later introduced the Pamagirri Aboriginal Experience and Koala & Wildlife Park. They started Tropic Coach Tours in 1981. The company currently employs more than 200 staff across the group and is the Gray Line agent in Cairns. It grew steadily until the 1989 Australian pilots’ dispute, which stalled tourism in Cairns. Charles and Pip survived the early business years by working even harder and being frugal, Woodward explained. "For quite some time Tropic Wings was more of a lost leader; Dad’s philosophy was ‘one pocket to another’ kind of thing, but in more recent times we’ve had more of a focus on Tropic Wings and revamping our fleet, which has changed our business model," Michael Woodward said. 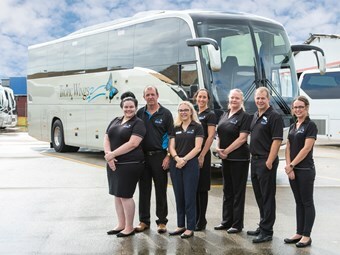 The company started acquiring Yutong coaches in 2013, and over time has gone from having the oldest fleet in Cairns to the newest, it’s stated. "It was an opportunity that represented itself. We had tried other brands with limited success and out of the cheaper Chinese brands Yutong certainly presented excellent reliability and value for money and fuel efficiency," Woodward said. It was a slow acquisition with the family adding two coaches late 2013 to the fleet, followed by another four in 2014, six in 2015, four in 2016, and a couple more in the past two years. "We found they had excellent value for money and fuel efficiency, and ... extra seat capacity which when you’re doing tours was just as important," Woodward said. Tropic Wings' Yutong fleet ranges from 22-seaters to 57-seaters. Some are upgraded every three to four years, with the rest every nine years. "It’s probably not as planned and as strategic, but it does keep us adaptable to different demands in terms of what the demand is for our coaches in peak periods and quieter periods," Woodward said. "Our recent philosophy has been diversification; in February we took on some school bus runs and very recently we have signed a contract to take on another four bus runs and some charter business. "Not being wholly reliant on tourism is going to be a bit of diversification for the company, but also produce some synergies and economies of scale." The business transaction was fairly smooth with the company planning on taking another acquisition soon. "Whilst recently there has been a fair bit of expansion, this [acquisition] will be taking on 18 buses in the near future. Out of that fleet there are some very old buses that we’ll be turning over and downsizing," Woodward added. Tropic Wings stays current by always having well-presented coaches and trained and friendly drivers that are customer-service driven. "It’s well and good to have a fancy coach, but if the person driving it is rude or unprofessional then that can ruin a customer’s experience in tourism; it’s a case of being fully aware of customer service," Woodward explained. "For running you need great operations and driving staff and management – so people who are customer service driven. It helps to have a beautiful region, too, that we are all proud of being far north Queensland. "We want our drivers to be passionate about the region of Cairns; there’s a wealth of choice for visitors to explore and enjoy and that should be enough to get our drivers in the right frame of mind to encourage our guests and visitors to enjoy as well." What makes Tropic Wings unique from other coach operators is that it’s not just a tour or a coach operator; the team is heavily involved in tourism’s attractions. "It’s not so much a selling point, but it’s certainly what is different; we’d like to think a unique selling point would be we have a huge focus on driver engagement with our clients." With a pilot strike behind them, followed by bird flu and a severe acute respiratory syndrome (SARS) scare that saw tourism numbers drop in Australia, Tropic Wings has learnt to be more careful with overheads over time. "Back then we were probably not as prepared, but we were adaptable enough to change course and that’s one thing you learn in tourism – nothing ever stays the same, you can’t take anything for granted," Woodward reflected. "Of late we’re getting a little bit more strategic in terms of risk management and documenting our risks and how to mitigate them. "Even when times are tough and there is a global financial crisis, one way of mitigating risk is to diversify outside tourism. Even though those are our roots and part of what we do, part of mitigating risk is diversification." With eyes set on ways to improve the business, whether it’s expansion or acquisition, Tropic Wings will be replacing its second-hand coaches with Yutong vehicles. "We keep an eye on it, but we’re not hungry or desperate to expand," Woodward said. "We’ll be looking at consolidating and making sure we retain and look after our existing clients; it’s much easier but still very important to retain your existing clients because finding new clients is always a huge challenge." The company has some 109 clients in charter and 260 in day tours on its books. "Understanding that not all clients have the exact same expectations or customs is one important fact of service, but there’s also of course engagement and I think the most universal language is body language and facial expression and a smile, which can’t be taken the wrong way; service with a smile can break down all barriers." After a long battle with cancer, Charles passed away on May 18 last year. He became a Member of the Order of Australia this year. Known for his work to better the lives of far north Queensland cancer patients, Woodward is proud of his father’s posthumous recognition. "I’m proud to say he was influential in the Cairns community in terms of working and founding a local cancer focus charity group [COUCH] and also other community service he has done over the years," Woodward said. "Someone once said he was a benevolent dictator; I think that was meant in a nice way. He was very detail oriented and very astute with business opportunities and quite a workaholic and he could do a lot of variety of detail, but also see the big picture." ABC Sales & Maintenance is part of the Woodward Family CaPTA Group, which also operates Tropic Wings Cairns Tours & Charters. Chairman of the CaPTA group, Charles Woodward, owned and operated coaches since 1981. The general manager of ABC Sales & Maintenance is Barry Henderson, who has an impressive background and experience in operating and selling coaches since 1978, it’s stated. Henderson has completed an accredited course at the Yutong factory located in Zhengzhou, China, and is fully qualified to not only sell a Yutong coach but to ensure it is serviced and maintained to the highest level, the company states.